Independent Speech and Language therapist, Jacqui Wright, has over 22 years experience in South Africa, the U.S.A. and the UK. She is author of ‘Cracking the Literacy Puzzle’, RCSLT Bulletin, March 2006. Here, Jacqui from Childhood Communication Consultancy, based in Carlton, discusses Sensory processing and Sensory circuits for children. There is an overlap of difficulties between the disorders: ADHD (attention deficit hyperactivity disorder), APD (auditory processing disorder), language and semantic disorders, dyslexia, dyspraxia, pragmatic language disorder (how language is used in context), autistic spectrum disorders (ASD) and Asperger’s syndrome. 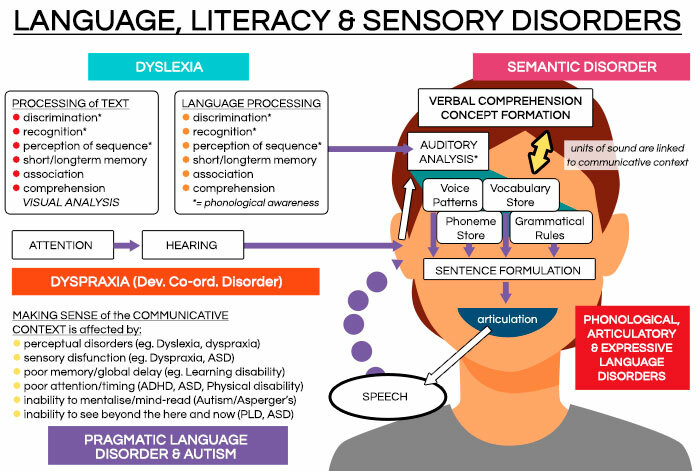 All these disorders can have sensory processing disorders (SPD)/sensory integration dysfunction but it is commonly linked with ADHD, semantic pragmatic language disorders, APD (& dyslexia), dyspraxia , ASD and Asperger’s syndrome. What is Sensory processing and Sensory integration? Sensory integration (SI) is the coming together of all the sensory processes from the body (hearing, sight, touch, smell, taste, body position and movement, balance, gravity, and internal body workings) in the brain in an integrated way in order to make sense of the world. This enables the child to act appropriately with motor movements and his/her behaviour in a purposeful way. Whether riding a bike, biting into a bagel, or reading a book, successful completion of these tasks requires sensory integration. A child may appear clumsy, uncooperative, belligerent, disruptive or out of control. An SPD child is at risk for emotional, social and educational problems due to motor difficulties, social communication difficulties, low self–esteem, anxiety, depression and aggression. SPD can persist into adulthood and affect an individual’s ability to succeed in marriage, work and social environments. Intervention and management for SPD will depend on the child’s particular level of need. Many of these children have normal or above average intelligence. Their brains are simply wired differently. They need to be taught in ways that they process information and to do sports or activities that challenge and develop their sensory processing needs. A child with suspected SPD will require an initial assessment by a Sensory integration (SI) trained therapist, usually an Occupational therapist (OT). This can be done at a Joint Clinic at the CCC practice with Jacqui Wright and her SI OT colleague. Following the assessment, strategies for home and school will be recommended by the SI OT, and also incorporated into Speech and language therapy sessions if required. This can take the form of a Sensory circuit in any of these environments. The child may need a course of individual SI therapy sessions with the OT. The aim of the treatment and strategies is to develop appropriate responses to sensation in an active, meaningful and fun way so that the child can behave in a more functional manner. This will generalise across home, school and social settings. A Sensory circuit is a form of SI treatment that involves: Alerting, Organising and Calming the child or group of children. It takes up to 15 minutes and can be done before school and after lunch time in school. It is effective in helping children with their sensory motor development and to be attentive learners in the classroom. Often, a listening programme will be recommended with the SI treatment. If you would like to know more about SPD relating to your child or any aspect of communication, please contact Jacqui.